Location: Saint-Jean-Lespinasse, in the Lot departement of France (Midi-Pyrenees Region). Notes: Château de Montal is located in France in the heart of the Bave valley in the municipality of Saint-Jean-Lespinasse in the Lot department, Languedoc-Roussillon region Midi-Pyrénées. First Renaissance style, it has two wings flanking the courtyard and has three round towers and a square tower. The roofs are covered with slate in the fashion prevailing at restoration. It is classified as historical monuments June 14, 1909.A castle called "den Saint-Pierre" is acquired in 1494 by Robert de Balzac, at the time of his marriage to Antoinette de Castelnau-Caylus. Robert de Balsac is Entragues lord chamberlain of Louis XI and Seneschal of Agen. He accompanied in 1495 King Charles VIII in Italy, where he was appointed governor of Pisa. 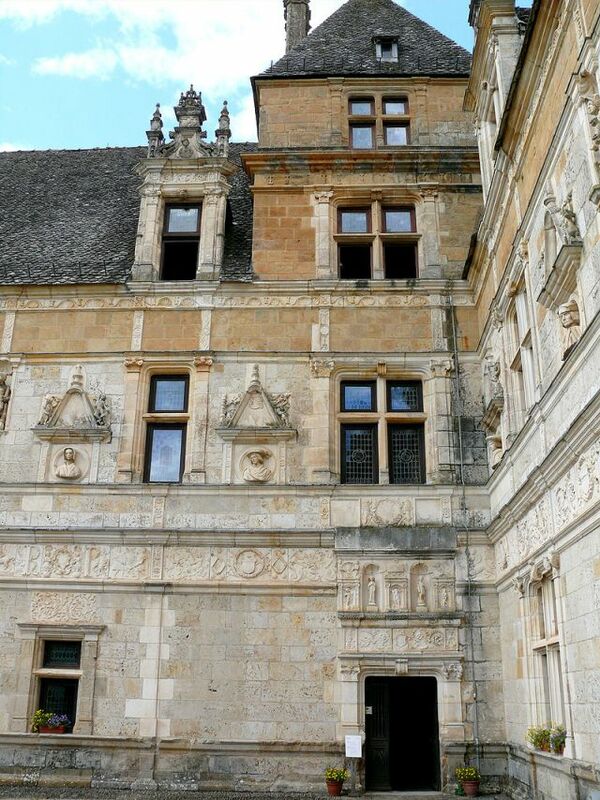 The construction was decided by her daughter Jeanne de Balsac Entraygues, who married in 1496 Aimery de Montal, Lord of Laroquebrou, whose name remained at the castle. Between 1519 and 1534 she transformed the pre-existing medieval remains in the renaissance style. Jeanne Amaury de Montal II widow since 1510, also lost his eldest son Robert in 1523 during the Italian wars. This explains the legend the motto inscribed on the pediment: "No more hope." These multiple bereavements have influenced the organization of busts sculpted facade appear when Amaury (or Amalric), Jeanne, and their two Dordet son Robert, daughter.